A walk in the woods in early spring is an optimistic activity. What I hope to find are wildflowers, but my rewards are often tawny, shriveled stems—the remains of last fall’s flora. If I’m lucky (more accurately, if it’s early April and warm), I’ll find the blossoms of Dutchman’s breeches (Dicentra cucullaria). These flowers are funny looking, distinctive floral pantaloons, creamy white with yellow trim. They dangle above feathery sage-green foliage that grows in mounded colonies. This unique wildflower has a short aboveground presence—it blooms, sets seed, and dies back before the trees overhead block the sunlight with their leaves. By June, the plant has utterly disappeared. In botanical parlance it’s a “spring ephemeral.” Other plants share this strategy: spring beauty, trout lily, trillium, Virginia bluebell, toothwort, rue anemone. These species have a small window of sunshine between snowmelt and leaf-out in which to grow, flower, be pollinated, and produce seeds. By mid-June the deciduous trees that tower above have cloaked the forest floor in deep shade. Spring ephemerals disappear in the heat of the summer, retreating underground until next year. Found throughout the eastern United States and Canada, spring ephemerals thrive on the floor of rich, undisturbed woodlands. This verdant, moist environment is the ideal site for myrmecochory, seed dispersal by ants. The seeds of spring ephemerals bear fatty external appendages called eliaosomes. The insects, attracted to the elaiosomes, carry the booty back to their nests, where the lipid-rich food source is consumed by their young. The unharmed seeds are thrown into a midden, a rich, composting stew that stimulates germination. A single ant colony may collect as many as a thousand seeds over a season. While the volume is great, the distance is not; on average, a seed is carried just two meters from the parent plant. Because offspring remain so local (unlike plants dispersed by birds or wind), habitat fragmentation is a major threat to the survival of spring ephemerals. Once these plants are gone from the forest, it is rare that they return. Of course, to have fruits, you need flowers. From a woodland walker’s vantage point, this is where spring ephemerals shine. One of the earliest flowers is rue anemone. Formerly named Anemonella thalictroides, the taxonomy has changed and it is now Thalictrum thalictroides— meaning meadow rue–like meadow rue. Silly Latin names aside, it is a lovely find during a walk in the woods. Diminutive in stature, its flowers are whorls of white petals above delicate, divided foliage. White wake-robin (Trillium grandiflorum) takes seven long years to journey from seed to flower. Then one spring as we thrill to hear the robin’s call, the wait is over; the plant carpets the forest floor with flowers. Showy, three-petaled blossoms of white (turning pink with age) rise above the leaf litter on single stems, highlighted by three green leaflike bracts. 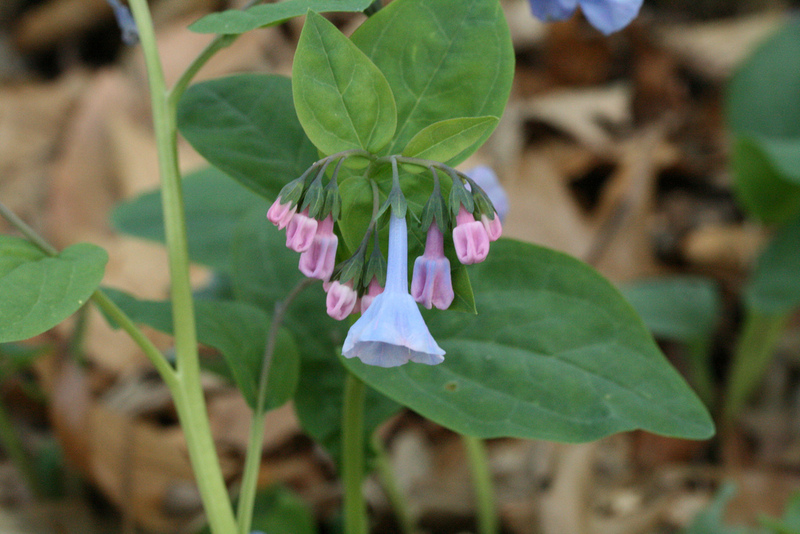 If your woodland rambles include floodplains, you may encounter colonies of Virginia bluebells (Mertensia virginica). Soft magenta flower buds open as tubular blossoms of an enchanting sky blue. The color is so rare and so exquisite that you may find it difficult to stifle a “barbaric yawp” worthy of Walt Whitman. Trout lily (Erythronium americanum) gained its fishy moniker from the resemblance of its fleshy, mottled leaves to brook trout. Intermittently presiding over these leaves are golden-yellow bell-shaped flowers. Large colonies may be over 100 years old, often older than the surrounding trees. 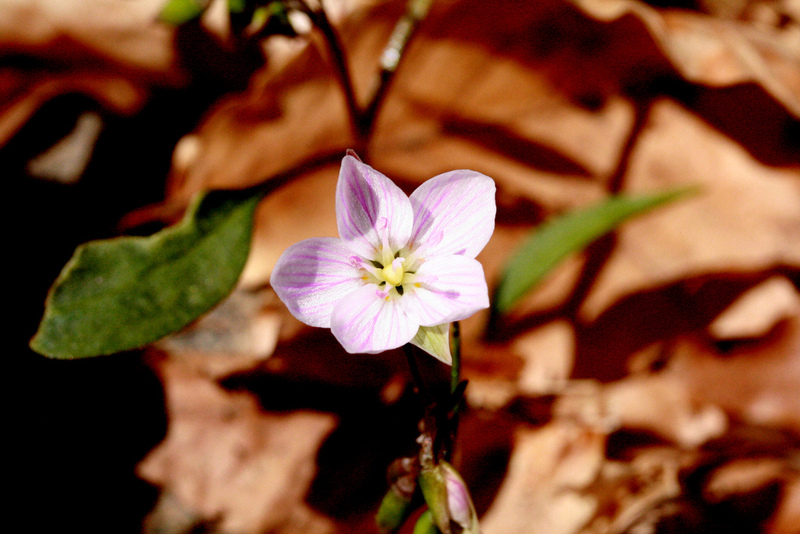 Spring beauty (Claytonia virginica) has delicate small white blooms with pink venation that follow the sun. It only grows about six inches high, but that’s tall enough to be found by the insects it depends on for pollination. In fact, the solitary bee Andrena erigeniae makes spring beauty its exclusive goal. 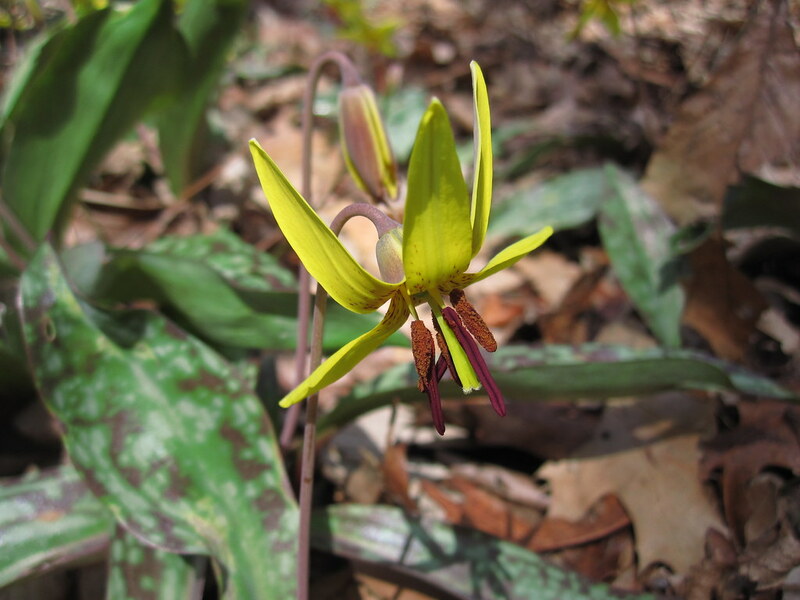 Trout lilies too have an andrenid specialist pollinator, the trout lily bee (Andrena erythronii). Bumble bees (Bombus species) are vital to the success of many spring ephemerals. In fact, the reproductive success of Dutchman’s breeches utterly depends upon bumble bee queens, which feed their larvae the nectar and pollen produced by these and other wildflowers when early-spring food sources are scarce. The young bees emerge as workers that pollinate other plants later in the season. Some Bombus species even choose their nesting sites relative to the abundance of early-spring ephemerals. There are other floral visitors that aid in pollination, including bee flies (especially Bombylius major), halictid bees (including green metallic bees), and muscid and syrphid flies. Less often, butterflies and skippers linger on the flowers. Despite their ubiquity and abundance, exotic honey bees (Apis mellifera) are not very effective pollinators. They may even disrupt ecological relationships between native insects and spring ephemerals. In the best of times, spring ephemerals face a number of obstacles to pollination, including a short blooming season, pollinator sharing due to overlap in flowering times, and inclement weather that interrupts insect activity. Human activity, overpopulation of herbivores like deer, and other threats add to their fragility. Although secure throughout most of their ranges, spring ephemerals are declining in urbanized areas. As late-successional species, they may require as many as 20 years after a disturbance to reappear. One of the biggest threats to our native spring wildflowers is posed by exotic plants. Lesser celandine (Ranunculus ficaria) is also a spring ephemeral, but one that hails from Eurasia. It emerges earlier than our native vernal herbs, shielding them from much needed early April sunlight and competing for resources. Norway maple (Acer platanoides) is also a problem. In addition to its root toxins, its earlier leaf emergence allows less time for the wildflowers to complete their aboveground life cycle. Invasive plants may do more than poison and compete for sunlight; they can also disrupt ecological relationships. For example, the native cut-leaf toothwort (Cardamine concatenata) is close kin to the exotic invasive garlic mustard (Alliaria petiolata). The food source for caterpillars of the rare West Virginia white butterfly is limited to native toothworts. Chemical cues induce the butterfly to mistakenly lay its eggs on garlic mustard. The unsuspecting larvae feed on the exotic leaves, and most die. Aggressive and prolific, garlic mustard muscles out the toothwort and makes it difficult for the butterfly to locate its vital host plant. The beauty of spring ephemerals can be a detriment to their survival. People often pick the flowers or harvest wild plants, disturbing or killing the slow-growing rootstocks. 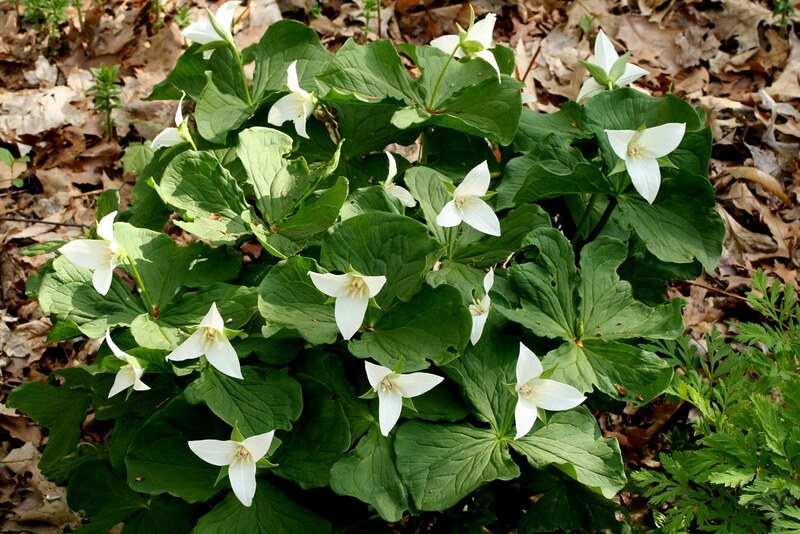 To make matters worse, unscrupulous poachers commonly steal entire patches of bluebells, trilliums, and other spring ephemerals from the wild to feed the demand for them in the horticultural trade. The loss of these wildflowers is deeply felt within the woodland. Despite their seasonal presence, the species play a critical role in the forest ecosystem. They stabilize soils, contribute important nutrients, and sustain native bee populations. To ensure their future in our forests, be careful to purchase native plants from reputable sources that state “nursery propagated” and not merely “nursery grown.” (Because of their exacting moisture requirements, seeds are harder to work with and are not recommended for beginners). If your garden grades into a woodland behind your home, choose nurseries closer to home to bolster conservation of local genetic ecotypes. To enjoy these spring wildflowers in your garden, site them in well-drained acidic soil in dappled sunlight (not deep shade). Plant the rootstock of young plants two to three inches deep. Over time, they will grow as much as six inches into the soil. Be sure to handle the corms carefully, since root damage typically stunts the plants, requiring more time for them to establish. The soil must be kept moist throughout the spring. Corms can withstand summer drought but must have some moisture in fall for root growth. Roots and shoots begin to develop after 90 to 120 days of dormancy. Cold stops further growth until spring. Annual maintenance requirements are few. To conserve moisture, mulch in the fall or very early spring using finely shredded leaves. (Larger leaves may create mats that prevent plants from emerging.) Fertilizer can be applied just as flower buds begin to appear to encourage a bigger and longer floral display. Older plants in your garden can be divided in early fall. Carefully dig the plants and cut the corm so that each small piece to be replanted has roots and new growth. Some spring ephemerals like trout lily grow obvious bulblike offsets that are easy to break off and plant. Place a wooden or metal marker next to spring growth to help locate plants after dieback. Can you help with a plant ID? I live near Shindagin Hollow Forest in Caroline Center, NY. There are large colonies of American trout lilies growing through the area where I walk. There is a similar plant, even more prolific—easily acres of green carpeting from the single green leaves. These leaves are not mottled, but bright green, however the growing habit is similar to the trout lily. And I recently found a small patch that was flowering: a short stem with five or six narrow green leaves with a white flower similar to the trout lily flower. The references I found online don’t show white trout lilies in NY. Can you help me identify this? Excellent article! I didn’t realize ants use compost heaps to aid in germination; fascinating! Thank you! Very well written and informative! I really enjoyed this article. 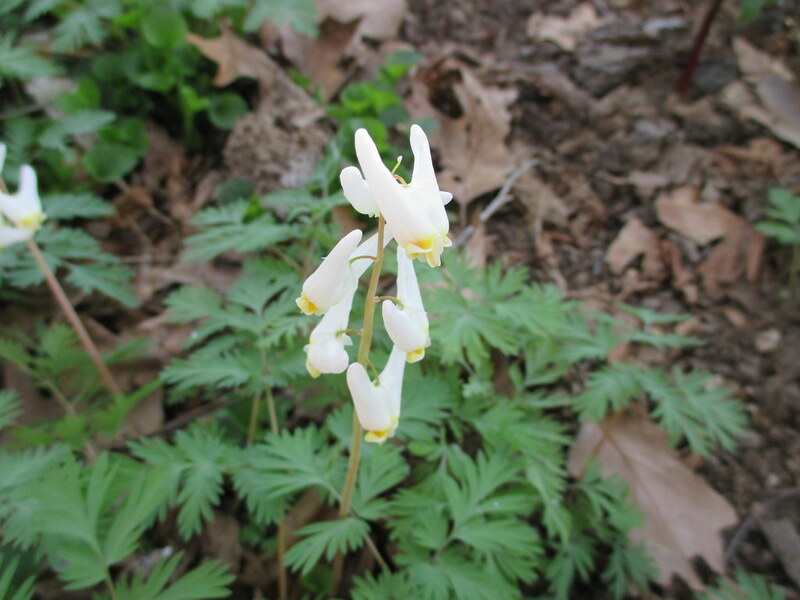 Dicentra cucullaria (Dutchman's breeches) in bloom. Erythronium americanum blooms in the Native Flora Garden. Photo by Rebecca Bullene. Spring beauty (Claytonia virginica) in the Native Flora Garden. Photo by Uli Lorimer. Virginia bluebell (Mertensia virginica ) buds and blossom. Photo by Uli Lorimer.